There are many great rewards on offer for completing certain objectives with the new TOS characters.. some of these will take some time, but the rewards are impressive. The most important one is once you get your TOS characters to tier 5 in all reputations eg nukara, omega, delta etc. you will get a account unlock that makes all crafted reputation gear to be Mk 13 Ultra Rare. this is great as it will save you alot of dilithium especially for crafting the iconian 4 peice space set. Another great reward is a starship trait for completing the story arcs (except the iconian and dyson). standard version is +2%crth/+10%crtd and the improved version is +3%/15% when using an emergency power ability for 15secs with no lockout period. 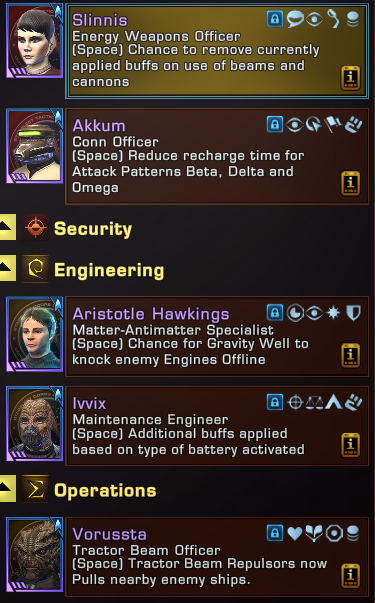 There is also a nice upgrade to specialization traits to a new "superior" version to the current spec traits on offer eg. pedal to the metal etc.. when you complete all the primary spec trees with your TOS character it will grant a superior version to the traits they have for all characters on your account. this will take some time to do. The last reward worth mentioning is the special doffs you can claim as you progress to tier 4 in the different trees. these rewards will take longer to obtain but there are some very nice rewards for doffs that would normally cost you hundreds of millions of EC. Only downside is that the golden specialist is the only one that is unlocked for all your characters, while the very rare ones are only for your TOS. but they are very special.. take a look. Thank you fror the great post OB!! you will get a account unlock that makes all crafted reputation gear to be Mk 13 Ultra Rare. Sounds like theres no need for grav well with a tractor beam doff? yes that should be forever, as long as you claim the rewards for all your characters from temporal agent. no grav well is far superior for crowd control, but the reverse tractor repulsors doff is very fun to use.. and its like 40+mil to buy. i have a wacky build using 3 different eject poop gas skills budo showed me while pulling through fart gas.